Capt John CUTTING (1593- 1659) was Alex’s 11th Great Grandfather; one of 4,096 in this generation of the Shaw line. Capt. John Cutting was a “Master” mariner; the first record shows him in command of the ship “Francis” of Ipswich, England which set sail the last of April 1634 with some eighty passengers aboard. Capt. John Cutting was born c. 1593 in London, England. (He gave his age as being 63 in April 1656. His brothers and sisters were baptized at St Clement Danes, Westminster, London, England. His parents were Francis CUTTING and [__?__]. He married Mary WARD about 1615 probably at Little Wrathing or Ipswich, Suffolk, England. He died on 20 Nov 1659 in Newbury, Mass. Mary Ward was born in 1592 in Cholderton, Wiltshire, England. Her parents were Edward WARD and Judith [__?__]. After John died, she married in Newbury, Mass as his second wife John Miller on 1660 in Newbury, Essex, Mass. John Miller was a gentleman who matriculated at Caine and Gonville College, Cambridge. Mary died on 6 Mar 1663 or 1667 in Newbury, Mass. The name Cutting is a rare English surname which is almost exclusively found in County Suffolk with many in the area of the city of Ipswich. Capt. John Cutting was a “Master” mariner; the first record shows him in command of the ship “Francis” of Ipswich, England which set sail the last of April 1634 with some eighty passengers aboard. 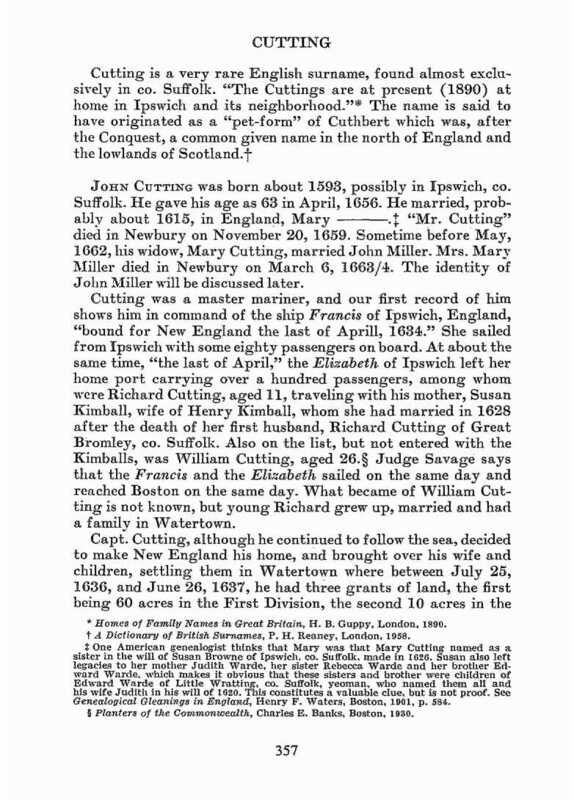 About the same time, the ship “Elizabeth”, William Andrews, Master departed from Ipswich, England with a Richard Cutting, age 11 and a William Cutting, age 26 among the over one hundred passengers aboard. Savage stated that these two vessels departed from Ipswich, England on the same day and likewise arrived at Boston on the same day. Passengers include our ancestors Robert PEASE Jr. Robert was accompanied by his brother John, his eldest son Robert PEASE – The Former, a Miss Clark, aged fifteen, who was the daughter of a fellow passenger, and a Miss Greene, aged fifteen, perhaps a servant. Robert Pease’s second son John PEASE may have been aboard as well. William HAMMOND, along with his older children, came to America before his wife and younger children, though the exact year is not known. Elizabeth PENN HAMMOND, aged 47 years, with children Elizabeth, aged 15, Sarah, aged 10 and John, aged 7 years embarked at Ipswich, England, in the ship, “Francis,” April, 1634, and joined her husband in New England. There is no known relationship between our Capt. John Cutting and the above mentioned Richard and William Cutting. Richard Cutting, born 1621 and died 1696, settled in Watertown, Ma. and married Sarah [__?__] in 1648. Captain John Cutting decided to make his home in New England and brought over his wife and children, probably sometime early in 1636, where they settled in Watertown, Mass. Between 25 July 1636 and 16 June 1637, Capt. John had three grants of land, the first being 60 acres in the First Division, the second being 10 acres in the Beaverbrook plain, and the third being 10 acres in the Remote or West Pine Meadows. He later received an addition 10 acres of upland. Mariner Capt. John continued his work as a sea captain until at least 1656. It is reported that he made thirteen trans Atlantic trips. His wife, Mary, proved herself of being very capable of managing her husband’s affairs while he was at sea. On one occasion, in 1639, she wrote a letter to the Governor, addressing him as “Right Worshipfull John Winthrop”. She was seeking the Governor’s support in obtaining payment for service of a man, brought over as a servant by them to New England, who was “bound” for eight years. Many of the early, especially single, people “indentured” themselves for a period of time in return for passage and nominal support costs. In this case, a Capt. Thornback, a kinsman of the servant in question, arrived from Virginia to negotiate the release of the servant; Capt. John was amenable to the idea but in the meantime the servant just departed with his goods in wife Mary Cutter’s shallop (a rowing or sailing vessel for use in shallow waters). Mary was asking the Governor’s support in obtaining 20 pounds from Capt. Thornback which she, Mary, thought was “little enough” for three and one years support of the servant including the servant’s original passage cost. The Cuttings removed to Newbury, Ma. around 1639; in 1641 a document shows Capt. John and his son, John, of Newbury, as Master Mariners of the good ship “Desire”, were bound to pay Lawrence Hazzard, shipwright of London, and Robert Crisp and William Wilbert, mariners, noted sums of money upon arrival of the ship “Desire” in London, England. In 1642, Capt. John Cutting was a “freeholder”,i.e., owner of a freehold, a form of tenure by which an estate, land/house etc, is held for life. He was one of the eight commissioners appointed to arrange for the moving of the village from Parker River to the Merrimac River. By 1645 Capt. John had received many other land grants including a 200 acre farm bounded by Falls River on the south. In 1648, Capt. John bought a house and land in Charleston and was a resident there. In a long document prepared and signed by Mr. Anthony Somerby on 21 Jun 1651 the Newbury holdings of John Cutting are recorded. His farm was granted him by the town of Newbury, containing 200 acres of upland and meadow he had sold to John hall for £100. Apparently, he also had 100 acres adjoining the farm which had originally been granted to Mr. Greenleaf who sold it to [our ancestor] Percival LOWELL who in turn sold it to Cutting. By purchase and grant he held upland and meadow in lots running from 6 to 50 acres with a house lot of 6 acres which he had turned over to the town in exchange for a house lot of the same size on East Street adjoining Thomas Hale’s by the nine lots. In 1651 he was styled a “gentleman” and Mary, his wife, was admitted to “full communion” in the Charlestown church in 1652. Mary acted as attorney for her husband when he, Capt. John, was at sea. The family returned to Newbury, Ma. by 1656. The last record of the living Captain John Cutter is dated 29 March 1659 wherein he was haled before the court at Ipswich for “taking tobacco in the bell yard”. He was fined but the fine was remitted until the court should take further action. Capt. John Cutting of Newbury made his will on 22 October 1659 with the will being proved on 27 March 1660. He was literate to a degree as seen in the opening words of his will. “Bee it knowne vnto all men by theife prfents that I John Cutting of Newbury in the County of Effex in Newengland being through gods mercy in health of body and perfect memory, Confidering ferioufly minr owne fraility and mortality, endeauouring to leave mine eftate to my relations as may continue loue & peace amongft them et al”. His will is quite encompassing and mentions among many, “his daughter Mary the wife of Nicholas Noyes”. The valuation of Capt. John’s inventory amounted to £737, a large estate for the time. Mary Ward Cutting Miller made her will on 26 Nov. 1663 which was proved 29 March 1664. The value of the inventory, not including land, total £71. Bee it knowne unto all men by thiese prsents that I John Cutting of Newbury in the County of Essex in New england being through gods mercy in health of body and of perfect memory. Considering seriously mine owne frailty and mortality, endeavouring to leave mine estate to my relations as may continue loue & peace amongst them, I do hereby make my last Will and Testament, first I comend my Soule into the hands of my blessed Redeemer Jesus Christ and my body when I shall decease this life, if I dy in ewbury to be buryed in the burying place in Newbury in hope of a happy resurrection. And for my worldly goods I dispose of as followeth, first I giue and bequeath unto mary my wife dureing her widdowhood, all my Lands goods and chattels. And so will and appoint her my sole executrix of this my last will and testament. But if my said wife shall change her Condition and marry againe, then I order and appoint that she my said wife shall pay yearely afterwards dureing her naturall life out of my lands fifteene pounds a yeare. That is to say. To my Daughter Mary, the wife of Nicholas Noyes fiue pounds a yeare, And to my Daughter Sara Browne of Charlestowne, the wife of James Browne, fiue pounds a yeare, and to my Grand child Mary–the wife of Samuell Moody, fiue pounds a yeare, and also out of my stocke to every one of my Grand children and great grand children thirty shillings a peice. And at the death of the said Mary, my wife I giue & bequeath unto my said Daughter Mary Noyes all that house and land now in the possession of Thomas Bloomfield that lyeth on the east side of the high way conteineing about fifty or fiue and fifty acres bee it more or lesse both vpland pasture land & meadow and after my said Daughter Mary Noyes her decease to remaine and abide to the proper use of her Son Cutting Noyes, his heires & assignes foreuer. 2dly I giue and bequeath vnto my Daughter Sara, the wife of James Browne abousaid & her heires, all the house I now dwell in, with the twelue acres of vpland that the house stands vpon, and three quarters of that twenty acres of Salt Marsh land lately purchased of Mr. Steuen Dummer bee it more or lesse. 3dly I giue and bequeath vnto my Grandchild Mary moody, the wife of Samuel moody abouesaid, all the house and Land that is in the possession of John Dauis with the six akers of meadow in the Birchen meadows and the quarter part of the twenty acres of the salt marsh land bee it more or lesse as is abouespecifyed, further I give vnto her my said Grandchild Mary Moody, all that parcell of arable land lately purchased of the said mr. Dumer, lyeing vpon the southwest of the highway betweene the land of Henry shorte on the southeast and John Knights land on the northwest conteineing about twenty or fiue twenty acres more or lesse. And the first yeare the said Samuell Moody, his heirs &c. shall possesse the abouesaid parsell of Land which shalbe after my wives decease, then the said samuell Moody or his heirs shall pay to my Daughter sara, the wife of James Browne aforesaid the summe of forty pounds. But if my grandchild Mary moody abousaid shall dye without Issue of her owne body, then all the land aboue specifyed that is hereby given vnto her, shall after her decease, Remaine equally to bee diuided vnto my abouesaid two daughters Mary Noyes & sara Browne & their Children for euer. And the forty pound that is here mentioned to be paid by Samuell moody vnto my daughter Sara Browne abouesaid, if paid before, shall be paid backe againe unto the abouesaid Samuell Moody my Debts and funerall rites being discharged by my said executrix. In witness whereof I the aboue mentioned John Cutting haue sett my hand and seale october the two & twentyeth. In the yeare of our Lord one thousand sixe hundred fifty nine. 27 May 1662 – Mary Cutting Miller granted to her daughter Sarah Browne “the freehold that my husband Cutting had” and the share in Plum Island that belongs to it. This was done with the consent of her husband John Miller was signed the deed with her. John’s wife Mary Coffin was born 1615 in Devon, England. Her parents were Peter COFFIN and Joanna THEMBER. Mary died 6 Mar 1664 in Newbury, Essex, Mass. John, Jr was noted as joint “master” of the ship “Desire” of Boston in 1641. John Jr married, prior to 1638, Mary (–) and they had a daughter Mary who married Samuel Moody. The latter two are mentioned in Capt. John’s will. It is assumed that John Jr died prior to the writing of the will. It is well established that Capt. John and his wife Mary had a daughter, Sarah, who married, prior to 1652, James Brown, born 1605 died 1676. They also are mentioned in Capt. John’s will. Sarah subsequently married, 29 Nov. 1677 at Newbury, William Healey and, as a third husband, Sarah married, 03 Dec.1685 at Newbury, Hugh March. There is, maybe, another daughter, i.e., Judith who supposedly married, in 1638, the above James Brown, as his first wife with Judith dying prior to 1652. Recognized documentary sources are divided on whether James Brown’s first, Judith, was a Cutting or a woman with a different surname. Mary’s husband Nicholas Noyes who was born in 1616 at Cholderton, Wilts, England and died 09 April 1701. He was the son of Rev. William and Anna Parker Noyes. – Wessacucon is allowed by the court to be a plantation & it is refered to Mr. Humfry, Mr. Endicott, Capt. Turner and Capt. Trask or any three of them, to sett out the bounds of Ipswich & Wessacucon or so much thereof as they can & the name of the said plantation in changed & hereafter to be called Neweberry. Most of the passengers who came to New England in the ship “Mary & John” were induced to remove to Newbury early in the year 1635. Tradition asserts that they came by water from Ipswich and landed on the north shore of the Quascacunquen (now Parker) river, about two or three hundred rods below the bridge that connects the “Lower Green” with the “Great Neck” and the town of Rowley. 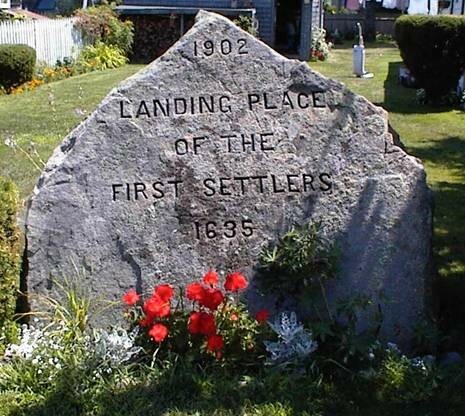 A monument marks the spot where the settlers disembarked in May or June, 1635. Tradition states that young Nicholas was the first person to leap ashore when their boat anchored in the Quascacumquen (now the Parker) River. 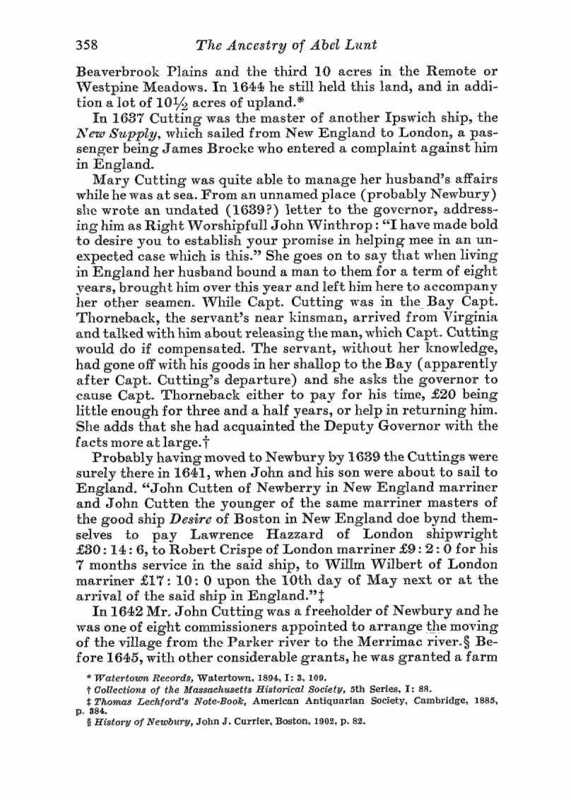 [John J. Currier, “History of Newbury” p.312; Sarah Anna Emery “Reminiscences of a Nonagenarian” p.112]. They joined 23 men and their families who formed a cattle-breeding company and were among the first settlers at Newbury where their children were born. Newbury’s first minister was a cousin, Thomas Parker. In the first allotment of lands granted to the settlers for house lot he did not receive any, probably because he was young and unmarried. 24 Feb 1636/37 – at a towne meeting it was agreed that Wm. Moody, James Browne, Nic. Holt ffrancis Plumer and Na Noyes shall lay out -all the generall fences in the towne that are to be made. Nicholas took the Freeman’s Oath as “Nicholas Noise” in Cambridge on May 17, 1637 when he and eight others walked from Newbury to Cambridge to vote for Gov. Winthrop. Their immediate purpose was to strengthen Governor Winthrop’s Party and prevent the re-election of Sir Harry Vane. [Records of the Governor and Company of the Massachusetts Bay in New England, 1628-1686 (MBCR) 1:373]. 17 May 1637 – Admitted Freeman. Nicholas Noyes, we learn from the historian, Coffin, took great interest in Governor Winthrop’s campaign for the governorship against Sir Harry Vane, as the close of the latter’s term drew near. So Mr. Noyes, with nine others including Thomas COLEMAN, John CHENEY, Henry Sewall Jr, Nicholas Noyes [Cheney’s future father-in-law], Robert Pike [future founder of Nantucket, liberal dissenter, witch trial critic and son-in-law of Joseph MOYCE], Archelaus Woodman [Edward WOODMAN‘s half-brother], Thomas Smith, James BROWNE, Nicholas Holt [future son-in-law of Humphrey BRADSTREET, and John Bartlett, walked forty miles from Newbury to Cambridge on foot to take the “freeman’s oath” and qualify themselves to vote in the election which was soon to take place. It was by such prompt movements that Winthrop was elected and the conservative party triumphed. He was admitted to the Newbury church prior to 17 May 1637 implied by freemanship. 21 Apr 1638 – He was one of five men fined 2s. 6d. apiece for absence from Newbury town meeting after due warning. The meeting was called to order at eight o’clock in the morning. Two of the men (not Nicholas) had their fines remitted, having sufficient excuses. It must have been very soon after this in 1638 that Noyes sailed on a voyage to England, possibly to settle family affairs and to report on conditions in Massachusetts Bay. He returned to New England on the Jonathan which sailed from London, probably soon after April 12, 1639, and “came to Anchor in Boston Harbor.” Also on theJonathan were Anthony Somerby of Newbury and Mr. Peter Noyes of Sudbury, who, having come over on the Confidence in 1638, aged 47, and found New England to his liking, had gone back to his home in Penton, near Andover, co. Hants, to fetch his family. Peter was doubtless a kinsman of Nicholas. [EQC 1:268; [New England Historical and Genealogical Register (NEHGR), 32:407-11]. 12 Mar 1641 – He is recorded as having 4 shares in the stint of the ox & cow comon. When it was proposed to remove the inhabitants of Newbury from their first settlement on the Parker river to a new site nearer the Merrimac, the name of Nicholas Noyes appears in the list of the ninety-one freeholders of the town and was a deputy “for the managing of those things that concern the ordering of the New Town” on Dec 7, 1642. When the lands at the “new towne” were laid out he had a lot “joyning South Street” now Parker street. He was on the Ipswich and Salisbury grand jury, 29 Sep 1646, 24 Apr 1649 [EQC 1:103, 164]; petit jury, 28 Sep 1647, 26 Sep 1648, 25 Mar 1651 [EQC 1:124, 146, 210]. 10 Dec 1646 – At a towne meeting the towne being informed that Mr. Thomas Parker was unwilling to act any longer in any matters concerning the new towne & that Mr. Cutting was going to sea, they were apprehensive of the weighty occasions of the towne that are likely to bee retarded, did make choyse of Nicholas Noyes & William Titcomb in their roome, to be added to the rest of the new towne men for sixe weeks that so things may with more speed be dispatched. 16 Dec 1646 – He was “sent” at the meeting when orders and grants were made in regard to the removal of the town. 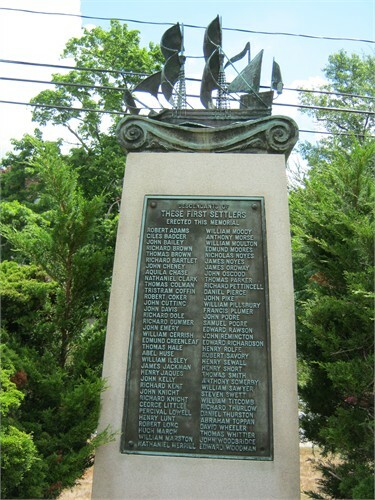 Apr 1647 – He was one of seven men chosen to “act in ye Prudential affaires of ye Towne for one whole year from ye date hereof” and was re-elected to this service Apr 27, 1648, and March 1, 1674/75 and as selectman, Mar 4, 1677/8, Mar 7, 1680/91 and Mar 11, 1683/84. At Salem Court, 6:5:1647, he was appointed one of the administrators of the estate of John Lowle [John LOWELL] late of Newbury, deceased, until the General Court takes further order. At Ipswich Court 28:7:1647 he was one of the jury in the case of Mr. Symonds v. the Towne. At the same court, Mr. William Gerrish, Richard Knight and Nicolas Noice, Administrators of the estate of John Lowell acknowledged judgment of £40 in favor of Persifall Lowell against the goods of John LOWELL. The assignment of James Godfrey by Mr. Jo Spencer to Nicolas Noyce of Newbery, dated Oct 17, 1646 confirmed at Ipswich court 28:1:1648. 27 Apr 1648 – Thomas Marvyn was granted two akers of land lying near to the new pond on back side of Mr. Nicholas Noyes house lott at the new towne for his encouragement to kill wolves. Nich Noyse in list of Jury of trials Ipswich court 26:7:1648 and 25:1:1651. Nicolas Noyce one of, grand jury as Quarterly court Salisbury, 24:2:l649. 19 May 1650 – Mr. Woodman, Henry Short, Nicholas Noyes & Richard Knight were chosen to lay out ” highways from all parts of the Towne to the mill and also to the farms.” This committee granted Richard Pettingell fourteen akers of Land in exchange for land given up for a convenient way for the town’s use. Q. C. Ipswich, 24:7:1650, he was a witness in the case John Tillison fined for his many offences. In the Registry of Deeds at Salem- Ipswich Deeds, vol. l. p, 183 there is a Transcript of the lands of Mr. John Spenser of Newbury, signed by Edward Rawson, William Titcomb, Edward Woodman and Nicholas Noyes. He was Newbury clerk of the market, 30 September 1651 [EQC 1:233; Selectman, 28 January 1660; 15 June 1681 [EQC 4:139, 8:148]. His most important service, however, was as deputy to the General Court in 1660 and in 1678 when on September 19 he was chosen by the town “to serve at the next session of the Court until it be ended,” a special session having been called for October 2 at which the oath of allegiance to King Charles II was submitted and signed by the deputies; he served also 28 May 1679, 19 May 1680, and 4 Jan 1680-84. Ipswich court 28:7:1652, in case of Richard Kent v. William Moody. For making use of the ten acres of land granted him by the town on the west side of Merimack Ridge. Richard Kent, Jr., acknowledged before Wm. Gerrish, Edward Woodman and Nicholas Noyes, commissioners that he broke the wedge of one of the bars, etc. Also at the same court, declaration of Nicholas Noyes & John Pike in behalf of the town of Newbury, in the case of the town of Newbury v. Jo. Davis about some corn distrained for rates due from Mr. Clarkes farm now in possession of Jo. Davis, etc. 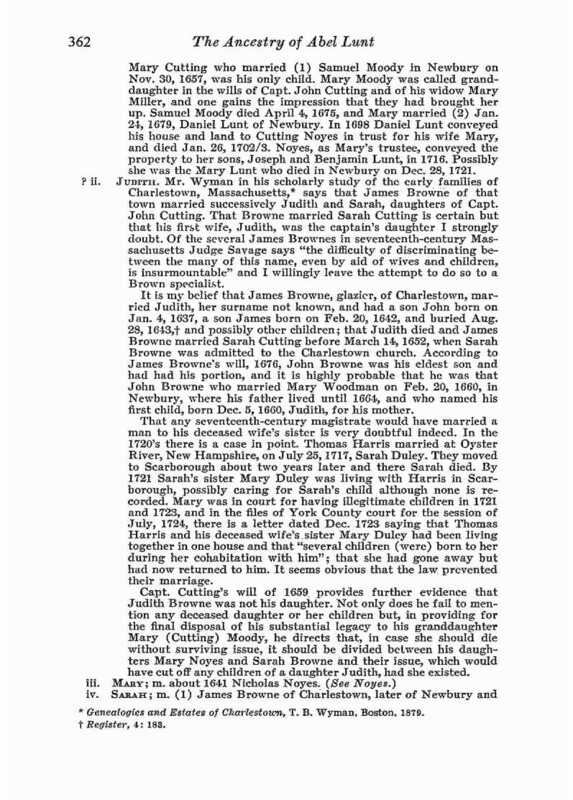 At the same court Nicholas Noyes and Anthony Somerby presented written testimony concerning Thomas Blanchard and his family who came with them to New England in the Jonathan about thirteen years before. 29 Nov 1652 – Mr Woodman, Richard Kent Jr Lieut Pike and Nicholas Noyes chosen to be “a committee for manageing the business of the school” that a school house be built and that £20 a year be appropriated for the schoolmaster. Evidently they failed to accomplish much business for on May 6, 1659 at Ipswich Quarterly Court, “Town of Newbury for want of a lattin scool” is ordered to pay five pounds to Ipswich Latin school unless by the next court they provide a Latin school-master according to law. [EQC 2:70]. 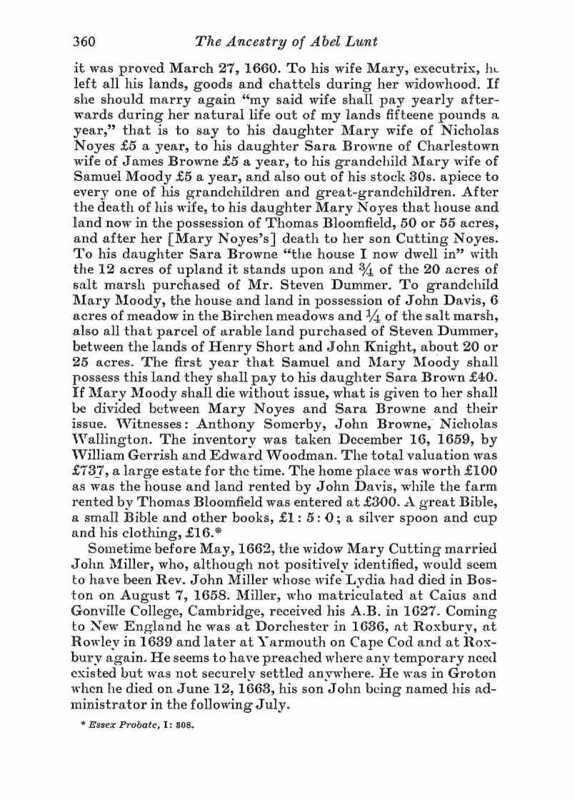 13 Jun 1653 – Samuel Bidfeild, George Little, Anthony Somerby, Francis Plummer and Nicholas Noyes took the Inventory of the estate of William Stevens of Newbury reported at Salem Q.C. in July 1653. 29 Sep 1653 – His wife was brought into court for wearing a silk hood, and scarf, but was discharged because it was proved that her husband was worth two hundred pounds. 28 Mar 1654 – At Ipswich Court Capt. Gerrish, Nicholas Noice and John Pike were sworn commissioners to end small causes for Newbury. March 29,1659, Mr. Edward WOODMAN, Nicholas Noyse and Lt. John Pike were sworn for the same service. 31 Mar, 1657 – Nicholas Noyse and John Pike were sworn. 29 Mar 1659 – Mr. Nicholas Noyse. March 25, 1662, Capt. William Gerrish, Mr. Edward Woodman & Nicolas Noyse were chosen and were re-elected for two succeeding years. 5 Mar 1665/56 – Capt Gerrish, Mr. Joseph Hill & Nicholas Noyes were chosen and were reelected for three terms. 3 Mar 1672/73 – Capt. Gerrish, Nicholas Noyes & Lieut. Woodman were chosen and reelected for three successive years. 5 Mar 1676/77 – Mr. John Woodbridge, Nicholas Noyes & Daniel Pearce Jr. were chosen. 19 Jul 1654 – Nicolas Noyes, Anthony Somerby and Robert (his mark) Adams were witnesses to lease of Richard Kent of Newbury, yeoman, to Lancilit Graneger of his great Island or farm. Nicholas Noyes and Capt. William Gerrish were appointed to interview those who had signed the petition asking the release of Robert Pike, which was presented to the Generall Court, May 14, 1654 and to make a report of the reasons given at the October session of the court. Henry Fay who died June 30, 1655, owe Nicholas Noyes 10s. 21 Sep 1655 – Mr Nicholas Noyes of Newbery, gent. and Robert Long of Newbery, weaver, were appointed attorneys for Thomas Noyes of Sudbury, yeoman, to let his house and lands in Newbury, formerly Henry Fay’s. Thomas Noyes of Sudbury, son of Peter Noyes, had apparently settled in Newbury, but returned to live in Sudbury before 1656 when he appointed his friend Mr. Nicholas Noyes, gentleman, and Robert Long, both of Newbury, his attorneys to let his house and lands. 14:3m: 1656: In answer to the pet of the inhabitants of Salisbury in refference to the settling of the bounds between Hampton & them, the (General) Court hath nominated Lieut John Applton, Mr Joseph Metcalfe & Mr Wm Bartholmew of Ipswich, Nico Noyce & Daniel Pearce of Newbery who are hereby empowred a commissiors to act in this case according to former orders of court; & whatsoever they or ye major pt of them shall conclude in reference to the sd bounds mentioned in the pet to stand firme & good pvided that Capt Nico. Shapleigh of Charles Towne be pcured by the ptyes to assist the commissionors in drawing out a plott & rÃ¼ning the line according to their direction; the charg of the commissiors to be borne equally by both townes & the artist to be payd by Salsbury only & that a true returne be made of what is done herein to the next session of this court to be ratifyed & confirmed. Apparently the results of this committees work was not agreeable to the parties concerned, for on 6 May 1657, these bounds not per-fected & settled to the satisfaction of the parties the same committee members were recalled to repeat the service. 26:9:1656, at Salem court. 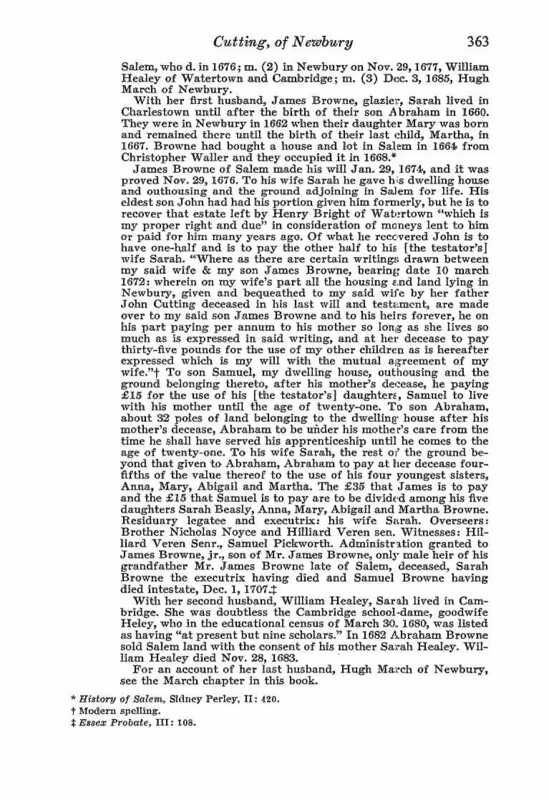 Will of Mr. James Noies of Newbery was proved by Capt. Wm Gerrish and Nicholass Noies. Sara Noyes, the widow swore to the inventory, 21 Nov. 1656, before Edward Woodman and Nicholas Noyes. At a meeting of the selectmen Jan. 26, 1656/57, Henry Short & Nicholas Noyes stated that there was a way through Richard Kents Island from the way that is 1aid out thru John Cheny’s land to the way that is laid out over the marsh. 29 7:1657, Richard Kent sued John Cheny at Ipswich court. For denying him a way where it was laid out. John Chenye ordered to make this way laid out by the town sufficient, as Mr. Nicholas Noyes and Henry Short should judge. 9 Apr 1657 – At Ipswich court, in the case of William Titcombe presented for lying at a general town meeting when they voted for governor, it was reported that Richard Brown. Henry Jaquish, John Knight, Captain Gerrish, Nicholas Noyes, Richard Knight, Atony Sommarbee, Henry Lunt & Heu March had been arbitrators in the matter. 19:9:1657, at Ipswich court, Nicholas Noyes and Joseph Noyes deposed in the case of John Chater presented for detaining a steer that was lost out of Mr. Noyse herd. 26 May 1658 – The General Court “In answer to the petition of seuerall other inhabitants of Newbury informing of disorders dc in ye last peticon of theire neighbors, the Court judgeth it meete to declare that the execution of what is passed in referenc to ye former petition be suspended, and the case to be in status quo; & it is ordered yt the secretary issue out his warrant agt the next Gennerall Court to Jno Emery, Jno Webster & such others as are named in the papers brought into the Court, to appear before the Generall Court in October next to answer wt is laid agt them for theire abusive carriages in that petition & yt Hen Short, Rich Kent, Rich Knight, Nicholas Noyes & Anthony Somers by then also appeare & make good wt they chardge agt the other persons. Mr. Nicho Noyes served as Deputy to the Generall Court Dec. 9, 1660, May 18, 1678, May 19, 1680, & Jan. 4, 1680/81. 25 Mar 1662 – At Ipswich court, Nicholas Noyes and Hugh Marsh in the name of the selectmen of Newbury v Willm Sawyer for detaining and not resigning up ten acres of salt Marsh. Withdrawn. 28 Apr 1662 – Nicholas Noyes, George Abbott, Richard Parker & Nathan Parker took inventory of the estate of John Stevens of Andover. 28 Jun 1662 – Nicholas Noyce & Samuel Moody took the inventory of the estate of John Brabrooke. At a meeting of the commissioners of Newbury, Aug. 27, 1662, Mr. Woodman, Capt. Gerrish & Nicholas Noyes being present, in the case of Samuell Plumer attorney for his father v. Richard Dole for cutting and carrying away hedging stuff from land of Francis Plumer. The commissioners found for the plaintiff. Richard Dole the defendant appealed to next Ipswich court. Sept. 30 at Ipswich court the verdict was given the defendant Samuel Plumer, upholding the decision of the commissioners. Inventory of the estate of Rev. William Worcester of Salisbury was taken, 6:9:1662 by Edward French Richard Wells and Nicholas Noyes. 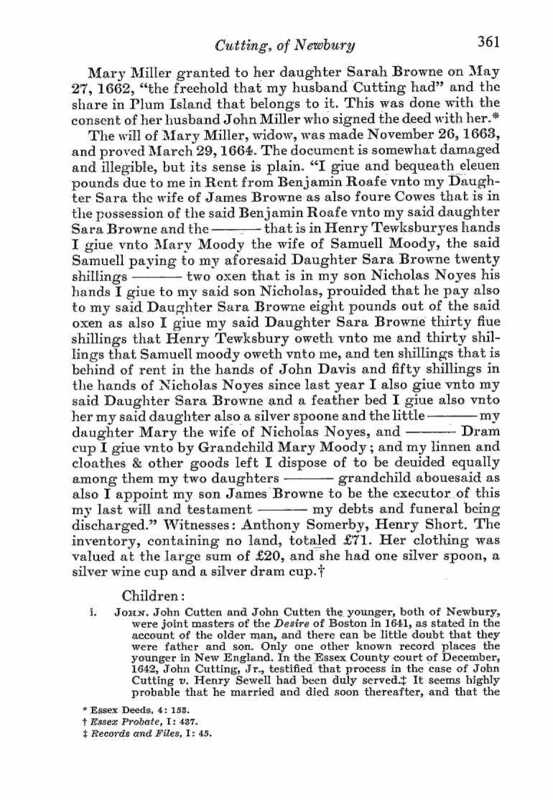 When Mary Miller, his mother-in-law made her will on â€œnouemb: 26th 1663, â€œshe gave “two oxen that is in my son Nicholas Noyes his hands I give to my said son Nicholas prouided that he pay also to my said Daughter Sara Browne eight pounds out of the said oxen”. She also made a bequest to “my daughter Mary the wife of Nicholas Noyes”. Sept. 11, 1666, he was one of those who signed the petition to the General Court, asking the adoption of conciliatory measures and the repeal of all legislative acts displeasing to the king. 30 Sep 1679 – “Nicholas Noyes” was one of ten Newbury men who “were discharged from ordinary training, each paying one bushel of Indian corn yearly” [EQC 7:263-64]. In the long and bitter controversy between Rev. Mr. Parker and Edward WOODMAN Nicholas was one of Parker’s chief supporters. He was chosen deacon of the First Parish of Newbury on March 20, 1683/84. On 19 March 1648[/9? 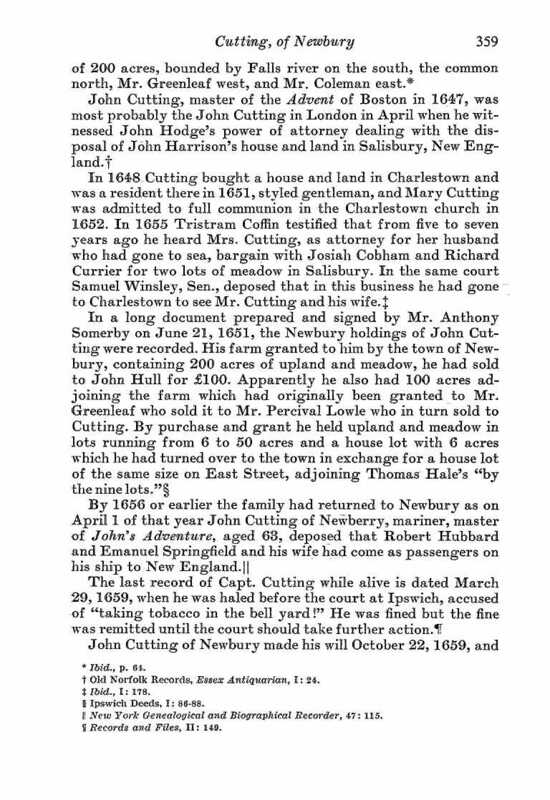 ], “John Spenser of Newbery” sold to “Nicholas Noice of Nubery … thirty acres of land lying in Newbury at the west end of his farm on the other side of the street called by the name of Merrimack Street” [ILR 1:95]. On 16 April 1651, “Nicholas Noyes of Newbury …, yeoman,” sold to “George Little of the same town and county, tailor, all that parcel of land, containing sixteen acres … in Newbury”; acknowledged 11 April 1664 by “Nicholas Noyes … and Mary Noyse his wife” [ILR 4:186-87]. On 4 January 1653[/4? ], “Henry Shorte of Newbury …, yeoman, & Sarah my wife” sold to “Nicholas Noyes of the aforesaid town & county, yeoman also, all that parcel of land formerly purchased of Nicholas Holt, containing forty acres … in Newbury” [ILR 5:421]. 26 Apr 1655 -“Nicholas Noyes of Newbury … & Mary my wife” sold to “John Allen of the abovesaid town & county all that parcel of land which was lately William Mitchell’s, which the said William Mitchell purchased of Jno. Knight Senior & John Knight Junior and of John Davis, except the garden plot & the house & that which the house standeth upon & is for the yard, the which land & house being mortgaged unto Anthony Somerby lately by William Mitchell in his lifetime & since his death his wife not being in a capacity to redeem, the said Nicholas Noyes, with the consent of the widow of the said William Mitchell, deceased, have redeamed it the said house and land, and now also with the consent of the said Mary, the relict of the said William Mitchell deceased, & with the consent also of the abovenamed Anthony Somerby to whom the said land and house was mortgaged, he and said Anthony Somerby yielding hereby up all his right & title and interest in the said house & land”; signed by Nicholas Noyes, Mary Noyes, Mary Savory and Anthony Somerby [ILR 1:195-96]. 13 Oct 1659 – “John Woolcott of Newbury …, carpenter, and Mary my wife” sold to “Nicholas Noyes of the said town and county all that six acres of upland and marsh … lately purchased of Benjamin Swett, granted by the town to Thomas Brown” [ILR 2:69]. On 14 March 1660[/1? ], “John Bond of Newbury … & Esther my wife” sold to “Nicholas Noyes of the abovesaid town & county all that parcel of meadow and upland containing by estimation about nineteen acres” [ILR 2:26]. 1 Apr 1673 – “Nicholas Noyes and Mary my wife” for a payment of four pounds a year deeded to “our son Cutting Noyse all the right that we have in that farm lying and being on the east side of the way going to Merrimak [illegible] was formerly Stephen Dummer’s … likewise I Nicholas Noyes do reserve four acres of meadow … which is in exchange for Cutting Noyes to have four acres of salt marsh in Holt’s neck, likewise it is agreed upon by Nicholas Noyes and Mary his wife that if the four pounds a year be not paid according to agreement, that then five acres of the plowland and ten acres of the meadow on the south side of the farm the said Nicholas Noyes or Mary his wife may rent out” [ELR 33:8-9]. 6 Apr 1682 – “Henry Jaquish of Newbury …, carpenter, … with the consent of Anne my wife” sold to “Nicholas Noyes of the abovesaid town …, yeoman, … a parcel of salt marsh lying and being in the Great Marshes in Newbury containing by estimation four acres” [ELR 14:217]. 5 Jul 1692 – “Nicholas Noyes Senior of Newbury” sold to “Ensign Joseph Knight of Newbury aforesaid all my right, title & interest in a piece of arable land containing three acres … in the township of Newbury aforesaid in a common field there known by the name of the Common Great Field” [ELR 22:146]. 9 Apr 1696 – “Nicholas Noyes of Newbury” sold to “Samuel Smith of Haverhill … a certain messuage or tenement lying in Haverhill aforesaid containing about twelve acres of land … also three acres of meadow lying in said Haverhill … commonly known by the name of Duck Meadow” [ELR 25:103-4]. 19 Apr 1698 – “Nicholas Noyes Senior of Newbury” deeded to “my loving and dutiful grandson Nicholas Noyes of Newbury aforesaid, the eldest son of my eldest son John Noyes late of Newbury deceased, … about eighteen acres of upland lying in the township of Newbury … by name of Deacon Noyes His Neck adjoining unto a parcel of upland which I formerly gave to my son John Noyes deceased …, also I give to my said grandson Nicholas Noyes Junior eight acres of meadow … lying in said neck adjoining unto the meadow which I gave to my said son John Noyes aforesaid and was inventoried as his estate” [ELR 15:41-42]. The homestead of Nicholas Noyes was owned and occupied in 1885 by the heirs of Nathaniel Little. This entry was posted in 13th Generation, Immigrant - England, Line - Shaw, Pioneer, Public Office, Sea Captain and tagged John's Adventure 1656, The Advent 1647, The Desire 1641, The Elizabeth 1634, The Francis 1634, The New Supply 1637. Bookmark the permalink. Capt John Cutting is my 10th great, grand father. This is incredible information. I would love to know more about how you did the research. Ancestry.com is a main source coupled with patient internet searches. Hi, there is a picture of a sailing ship against the entry for Capt John Cutting. Is it a painting of the “Francis” or merely a general illustration of the type of vessel used in the Great Migration? 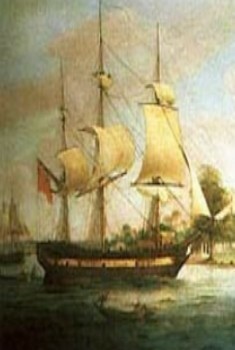 I am a descendent of John Livermore who was a passenger on the 1634 voyage of the “Francis”, and if the picture shown depicted the actual vessel it would mean an awful lot to me, particularly if a higher resolution picture was available. I tried to get the right type of vessel, but it’s a generic picture I think. Did you see my page where I put all my ancestors voyages I could find?